Although it was about 1:30 in the afternoon when we arrived at Pho 99, every available seat was filled, and the line of customers waiting for a table was about 5 deep. Nonetheless, the staff were quick to respond to the growing line of patrons, and in no time at all we found ourselves seated by a window overlooking old Highway 99 below. While we were impatient to eat, we soon realized that the wait would be worth it. This version of the classic Vietnamese noodle soup was aromatic with star anise and simply delicious! We didn't waste any time adding the bean sprouts and basil to the bowl we were sharing and squeezing a section of lime over everything. What a treat! 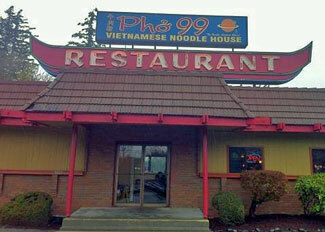 Without a doubt, if we lived closer to Bellingham, we'd be a regular customer of Pho 99!